Proposed changes to the Animal Welfare Act 1992. Thank you to everyone who provided feedback on the the Animal Welfare Legislation Amendment Bill 2019 from December 2018 to February 2019. We sought feedback to inform the final legislative framework that the ACT Government will introduce to the ACT Legislative Assembly in 2019. In September 2017, the ACT Government released the ACT Animal Welfare Management Strategy 2017-22. 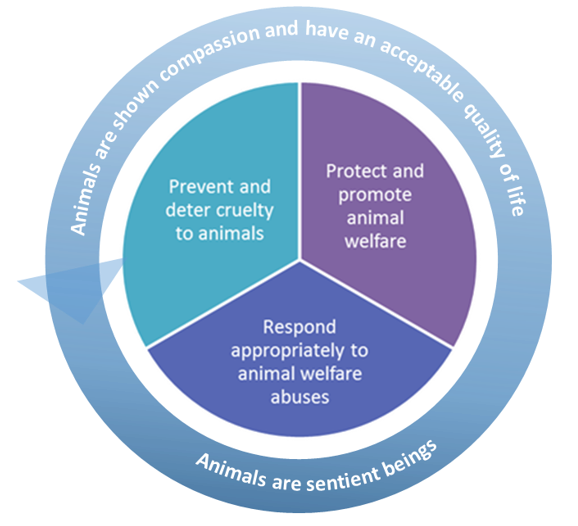 The Strategy committed to a review of animal welfare and management laws in the ACT to ensure, among other things, that animal welfare and management laws were up-to-date, best practice and in line with community expectations to ensure the highest standards of animal welfare and management. The Strategy was developed in partnership with the Animal Welfare Advisory Committee (AWAC), the ACT Veterinary Surgeons Board, RSPCA ACT, ACT Wildlife and the community following a community consultation process. The comments received through this process have informed the draft Bill we are now consulting on the Animal Welfare Legislation Amendment Bill 2019. Substantial amendments were made to the Domestic Animals Act 2000 in December 2017 and April 2018, in particular around the management of dangerous dogs. These amendments delivered on the commitment in the Strategy around reviewing animal management laws. In 2018, these changes and their administration were subject to an independent expert review into dog management in the ACT. The ACT Government is now delivering on our commitment to be a leader in animal welfare. The draft Bill includes a new section (44 (3A)) that restricts the number of dogs people can have in a public place. The draft Bill as first released limited this to two dogs. This is an error, the correct limit is THREE. The intent of this new section is improve public and animal safety and we are keen to hear what the community thinks about this. The amendments are proposed to ensure that the ACT has a best-practice, contemporary and effective regulatory system that protects and promotes the welfare of animals, prevents and deters cruelty to animals and responds appropriately to animal welfare abuses. Inform the final legislative framework that the ACT Government will introduce to the ACT Legislative Assembly in 2019. What are the amendments going to do?